I think every curvy girl should have a tailor on speed dial. They really work wonders when it comes to making clothes fit our bodies. 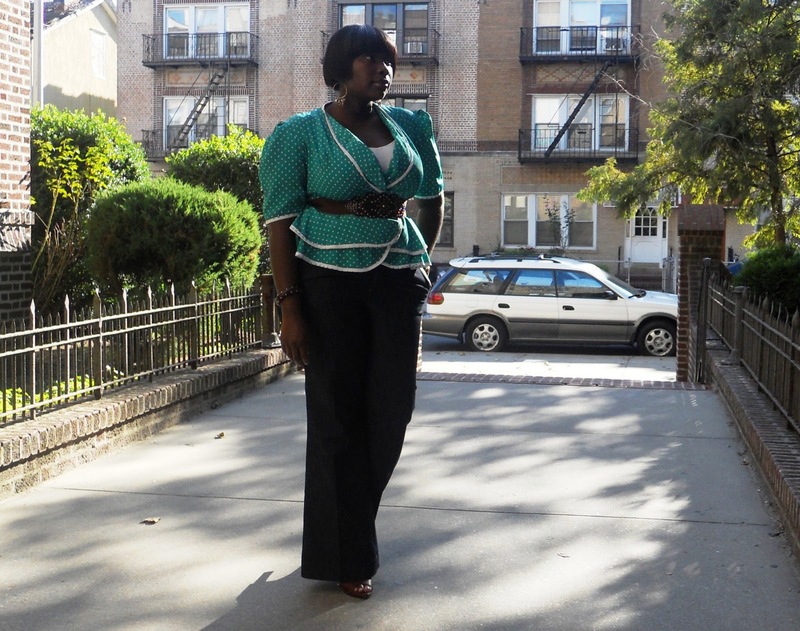 I bought this vintage polka dot jacket from none other than my fave resale store ReDressNYC. I saw it on a mannequin in the window back in June. I tried it on and it was too big. I knew what I had to do. So, I bought it and took it to my tailor over at Bridge Cleaners in Brooklyn. My tailor always educates me on pieces that require a little more work. This particular jacket was made for a tall person so he had to shorten the torso, take in the chest, and shorten the sleeves. Basically, he reconstructed the entire jacket. Once it was completed I loved it and thought that the jacket would look great as a top and paired with wide leg trouser jeans. I found this cool gold studded belt for $5 and thought it was a perfect touch to the outfit.